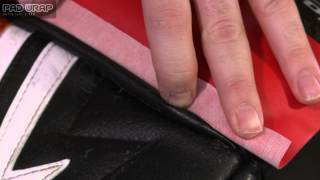 Pad Wrap is an all-new solution to a long-existing problem. Goalies have always liked style and color. Look good, feel good, play good, right? Well until now, goalies have been stuck with their original color scheme unless they buy a new set of pads. 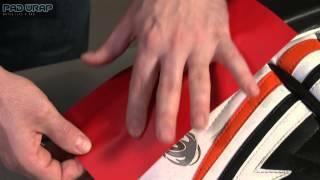 Pad Wrap is a thinner form of the synthetic leather material used to make goalie equipment, only it comes with a top-of-the-line adhesive that allows you to cut and customize your pads however you want! The best thing about Pad Wrap is that if you need to change your colors, it is as easy as peeling off your previous Pad Wrap. One might worry that removing such an adhesive would cause harm to the pads, but Pad Wrap leaves your pads completely unharmed! If you've got any doubt, maybe ask one of the 7 NHL teams currently using Pad Wrap! This wrap is great for team changes, adding some pink for Breast Cancer Awareness Month and even pad REPAIRS. Order a sheet today to see what the hype is about! bvseo-msg: Execution timed out, exceeded 500ms;Thread was being aborted. Can this go on reebok gear also? 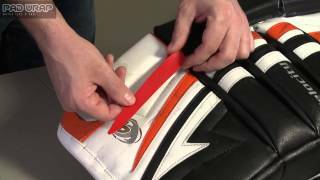 I have bauer rx8 leg pads and a reebok xlt24 glove and blocker and i was wondering if i could put it on that too. Yes, Pad Wrap is 100% universal. Is the yellow an actual yellow like Sweden yellow or is it more Sport Gold? Our yellow will be similar to sport gold.